Special Offers from Discount School Supply®! : Budget Boosters: All $2.99 or LESS! Shop Discount School Supply's Budget Boosters right now! Find tons of great products for $2.99 or LESS. That's right. $2.99 or LESS! It's just another way that Discount School Supply helps teachers, parents and caregivers get MORE for their money. BioColor® Paint, 16 oz. for only $2.99! BioColor® does it all! It's so amazingly versatile you will think it is magic! BioColor® is a must have for your Arts and Crafts center. It spreads and adheres easily to so many surfaces! Use it on paper, plastic, wood, metal, cardboard and more. BioColor® shines brilliantly when dry and won't crack or fade! Use for fabric painting, sticker art and marbling projects, or make multi-colored putty! Plastic Jump Rope for only $1.99! This red and white plastic jump rope is nearly impossible to tangle up. It measures 7 1/2' long and it is the perfect addition to your Active Play supplies. 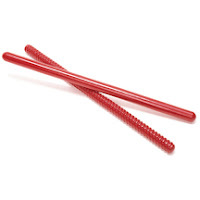 Rhythm Sticks - 10" for only $1.79! Bring out the musician in your little learner with these wooden rhythm sticks. Each stick is 2/3" thick. One stick is fluted for maximum rhythmic effect. Even if music is not part of your curriculum, these sticks will get your little learners moving and grooving for only $1.79. Wow! Find more top-rated products at rock-bottom prices online right now at Discount School Supply. Click here and save money with our Budget Boosters today! Discount School Supply continues to offer great deals on early childhood classroom essentials. Be sure to shop all of the product categories at Discount School Supply: Arts and Crafts, Manipulatives, Active Play, Dramatic Play, Curriculum Resources, Infant and Toddler, Furniture and more! Save more by shopping Budget Boosters today at Discount School Supply.